Going back in time a bit. There is a special love and hate relationship with these bad girls. About every 4 years have to go and try one again. They sort of have a high pitched screetch like they are arguing with you. The closer a surface target is the louder they blast drama into your ear. They are not the lightest nor balanced detector out there, unlike the petite Tesoro micro max units. Going to give one more a try and see if I can do some mods to change all that. For the price these days, find one cheap, they do make for a deep beep and dig. For those that don't care for menu driven push pad screen machines. 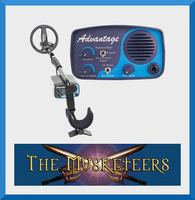 The Musketeer has enough switches and knobs for the touchy feelie kind of guy.